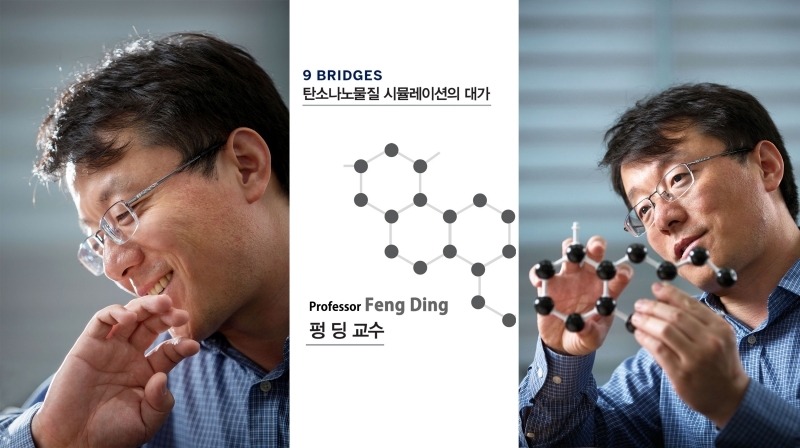 Prof. Feng Ding (School of Materials Science Engineering) has been living in Korea for two years, but his calm attitude during the interview made him look like he has been living here for a long time. He might be indifferent to his environmental changes or he may not have time to think about the things around him. Prof. Feng Ding explained how he came to Korea. Prof. Feng Ding’s life may be the result of coincidences. He only focused on his research and people around him kept giving him opportunities to work at different places. His current position in UNIST was also one of those job opportunities. It shows that he cares about maintaining good relationships with his colleagues as much as he cares about his research. Prof. Feng Ding was born in a small town in Shandong province in northeastern China in 1970. He says he couldn’t really read books when he was a child because his family was very poor (actually the whole country was poor at that time). His father was a middle school teacher, and his monthly salary was less than $ 10. In the 1980s, when Prof. Feng Ding went to secondary school, China appreciated and admired scientists. It was because people believed that science has the power to develop economically challenged societies. Fortunately, he was able to go to college since he was very good at mathematics and physics. At that time, only a few good students could make it to colleges. Prof. Feng Ding started to realize lots of new things after studying his favorite subjects, mathematics and physics, at university. The typical theoretical physics which is sitting in front of a large desk and writing a formula on papers was not enough to him. He had a premonition that the computer would play a big role in the future of his field. In fact, the Density Functional Theory, which is widely used today in computer simulation research, had already been developed in the late 1960s. But at that time, there was only a limited number of computers per university in China. 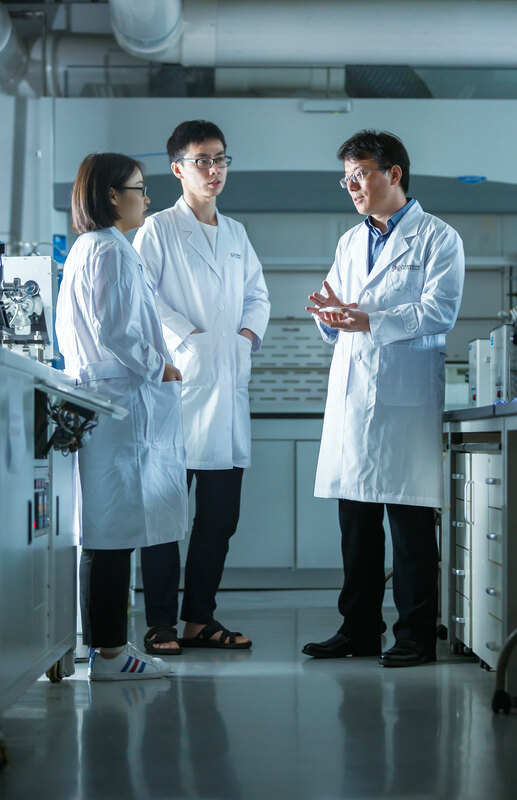 After graduating from college, Prof. Feng Ding entered the graduate school of Fudan University in Shanghai and received his master’s degree in theoretical research in superconductivity. It is an analytical method using a pencil as a statistical mechanics study. In 1996, Prof. Feng Ding became a professor at the QUFU Normal University in Confucius’ homeland, Shandong Province. At that time, China did not have many doctorates, so it was possible to become a university professor with a bachelor or master’s degree. For two years, Prof. Feng Ding taught physics to preliminary teachers, but he could not stop thinking about studying more about his research. Prof. Feng Ding entered the School of Physics at Nanjing University. With the cooperation of QUFU Normal University, Prof. Feng Ding was able to concentrate on his studies until he finished his degree. In 1998, Prof. Feng Ding became a graduate student and started a computer simulation study on clusters or tiny Nanoparticles- a subfield of condensed material physics. The dream he had since his undergraduate years finally came true. Prof. Feng Ding who had been studying coding for a couple of years while teaching preliminary teachers, was able to adapt to simulation research without difficulty. He received his Ph.D. in 2002 and returned to QUFU Normal University to teach his students. One day, he was accompanied to a conference by Prof. Arne Rosen of the Gothenburg University in Sweden. 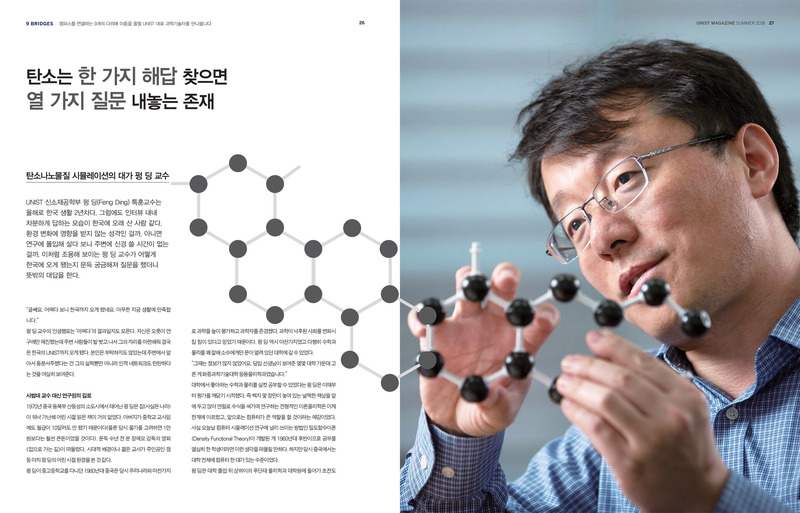 Prof. Rosen, who was doing simulation studies of carbon nanotubes at the time, proposed a researcher position, and Prof. Feng Ding left for Sweden in 2003, leaving behind a stable position to follow his curiosity. After learning at Gothenburg University for two years, Prof. Feng Ding moved to Rice University in the United States. 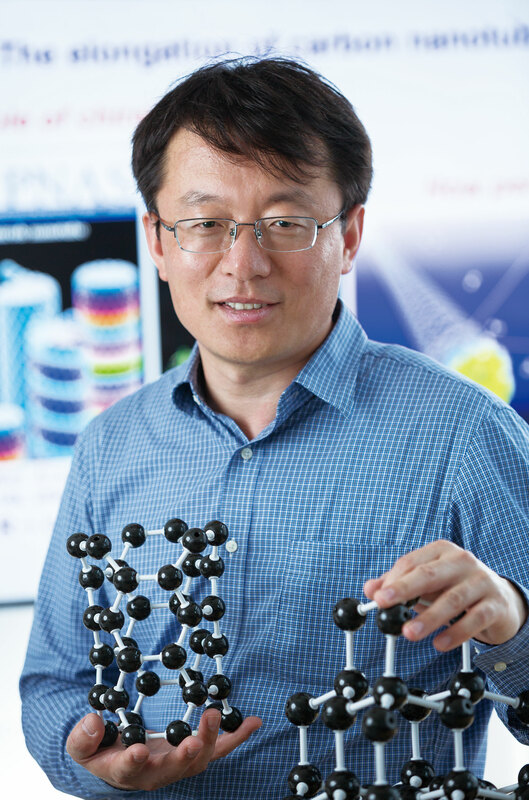 Prof. Feng Ding was a researcher for more than three years in a laboratory at Rice University run by Boris Yakoson. Prof. Yakobson was a close associate of Prof. Smalley and he was leading research on carbon nanomaterials simulation. 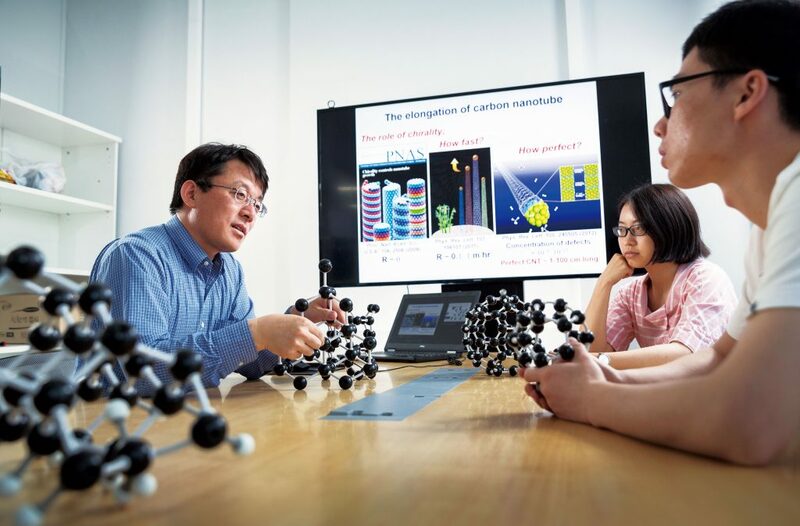 Prof. Feng Ding did a lot of research on various aspects, such as carbon nanotube growth and the mechanical properties of carbon nanotubes there and published about 20 articles in prominent journals. In 2009, Prof. Feng Ding returned to Asia. He taught in the Institute of Textiles and Clothing. Textile has nano structures, so there was something to do with his major. However, it was definitely a great challenge to him. He needed to learn a lot of fundamental knowledge about fibers, yarns, fabrics and clothing in order to teach students well. For researchers who study carbon nanomaterials, Computer simulation research is necessary to understand observed phenomena. 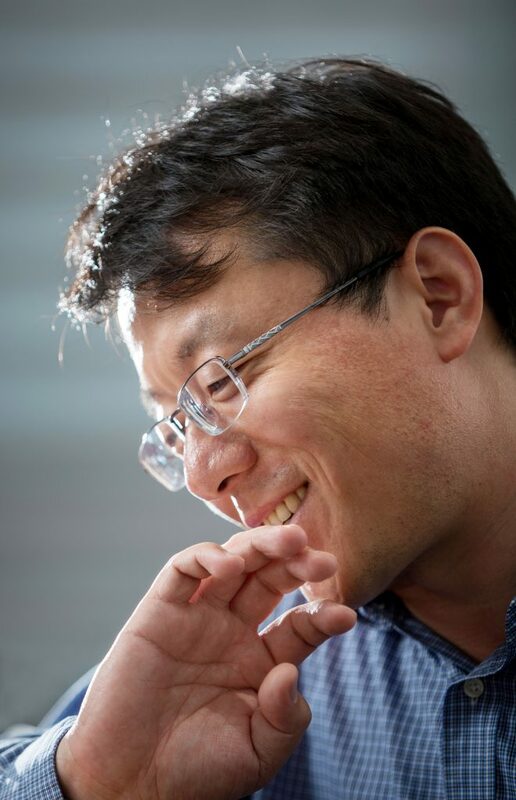 Therefore, Prof. Feng Ding has become a popular collaborator worldwide. Among the many research results that came out of this period, one of the most representative studies was published in June, 2014 in the journal Nature with the researchers of Beijing University. It was about a method for making specific carbon nanotubes with tungsten alloy-catalysts. It fully supported Prof. Feng Ding’s theory. Three years later, in March 2017, researchers also published another study that expanded the method in Nature. It was shortly after Prof. Feng Ding moved to UNIST. In the summer of 2015 Prof. Yakobson visited Professor Rodney Ruoff (School of Natural Science). Prof. Ruoff, director of Center for Multidimensional Carbon Materials, Institute for Basic Science (IBS), was looking for the right person to lead a theoretical group. Prof. Yakobson recommended Prof. Feng Ding for that position. Life in Hong Kong was satisfactory, but Prof. Feng Ding took the job offer. In less than two years, Prof. Rodney Ruoff and Prof. Feng Ding became a great team. The results of Prof. Feng Ding’s simulations make up a large portion of their recently published papers. The paper about graphene bubbles which was published in a prominent physics journal, Physical Review Letters (PRL), is a good example. The graphene bubbles, also called “embossing graphene,” are convex in the middle of the graphene plane, and are more chemically reactive than planar graphene. 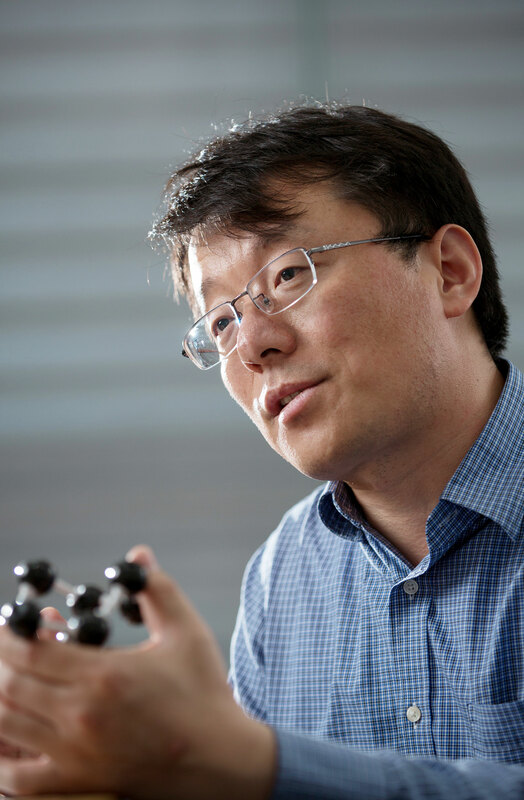 Prof. Feng Ding’s research team succeeded in calculating the temperature distribution inside the graphene and explained the confused experimental observations. On the other hand, the study of the ‘bending diamond’ published in Science last April received great attention from the media. When diamond, which is the hardest material, is made of a defect-free single crystal, it bends without breaking even if it is nano-sized and pressured. Prof. Feng Ding predicted the maximum force (tensile stress) just before it broke, and the experimental results were close to this. 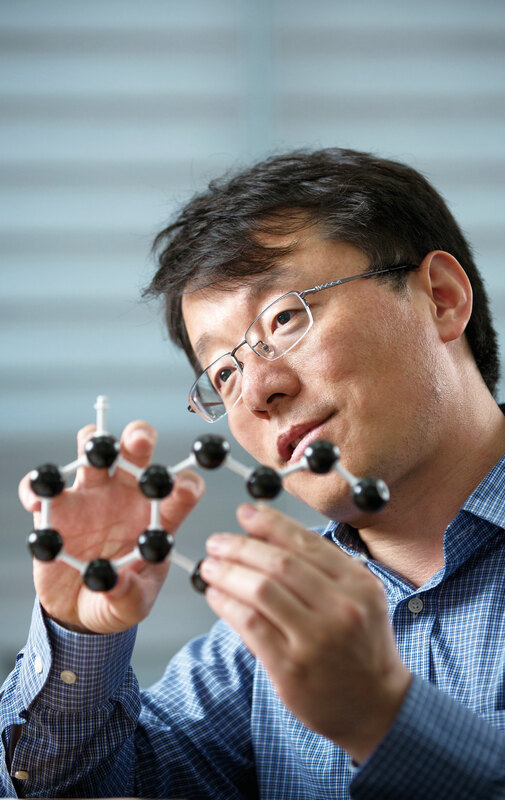 Prof. Feng Ding is attempting a new approach to research at UNIST. Experiments in real space, not the virtual space of the computer, are to be carried out concurrently. Even if you are predicting an interesting phenomenon based on the results of a simulation, sometimes it is burdensome to ask someone every time to test it. 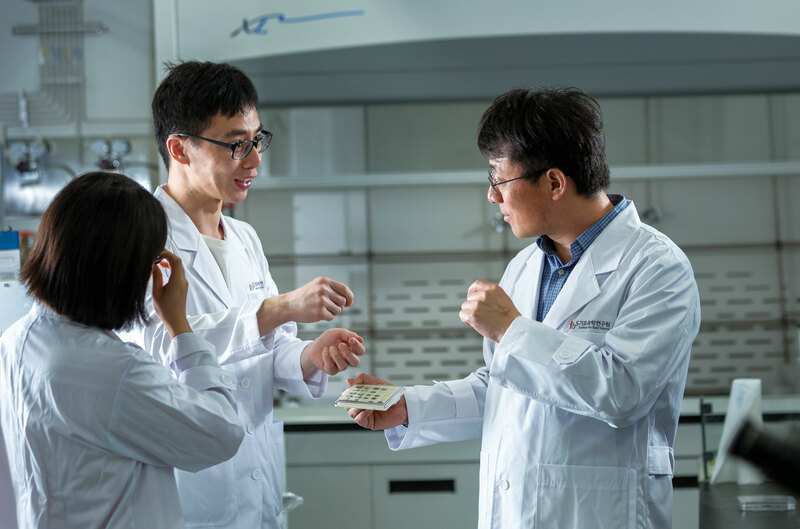 Prof. Feng Ding’s experiments may be small, but his expectations are very high.